When Andy and I moved in together he was absolutely appalled to learn that I did not own salt (or pepper for that matter). I didn’t cook with it. I didn’t put it in my pasta water. I didn’t have some hanging around just for guests. Nope. No salt in the house. It wasn’t some huge anti-salt campaign. I just have never really put salt or pepper on anything and never felt the need to own any. And the microwave popcorn that I used to live on came pre-salted. Now, five years later I’m happy to admit that I do put salt in my pasta water and in most foods. (But I will never, ever put salt in a cookie. I have to draw the line somewhere.) However, we still didn’t own any cute salt and pepper shakers… and let’s be honest, that’s kind of the point of having salt and pepper, right? For a couple of years now I’ve been seeing DIY projects to write things on coffee mugs using sharpie pens, and I thought, let’s try it on salt and pepper shakers instead! (Because, yeah, I also don’t drink coffee. Can I even be any more boring?!) 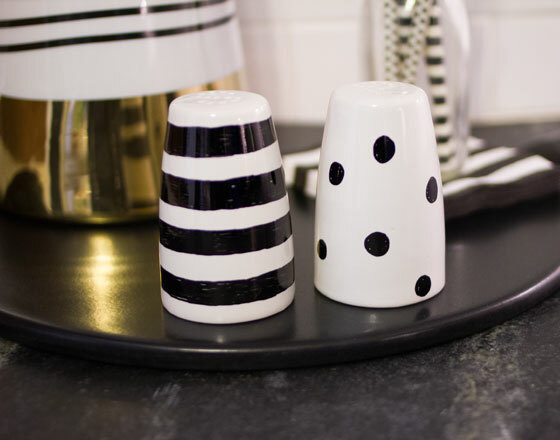 I was initially inspired by these striped and polka dotted Kate Spade salt and pepper shakers and the painterly quality of these ones from Kate Spade. I decided to do stripes for salt and polka dots for pepper, in that hand-drawn style. This was such a fun project and super easy, too! Step 1. Start with cheap white porcelain salt and pepper shakers (mine are from Target). I’ve read that cheaper ceramic is better because the sharpie will adhere to lower quality glazes better. Plus, who wants to risk messing up expensive pottery? Remove any rubber or plastic bits that may melt in the oven. Give the shakers a good wash and then wipe them down with rubbing alcohol to remove any residue. Then try to avoid touching the surface as much as possible to prevent transferring oils from your fingers. Step 2. Paint your design with a Sharpie Oil-Based Medium Point Paint Marker . I just freehanded everything, since I was going for a hand-drawn look, but this is a project you could make much fancier if you wanted. I also stuck to using just black ink because I like the contrast, but the oil-based sharpies come in colors and metallics. Step 3. Give your paint an hour or two to dry and then put your finished shakers in the oven on a cookie sheet lined with aluminum foil. Set the oven to 425 degrees F. Once your oven has reached 425, set your timer to 30 minutes. You’ll want the shakers to warm up and cool down inside the oven, to prevent any drastic changes of temperature that could cause the porcelain to crack, so leave them inside for an hour or two after you turn off the heat. I found that this processe smelled kind of crazy, but it all seemed to work out really well. Step 4. 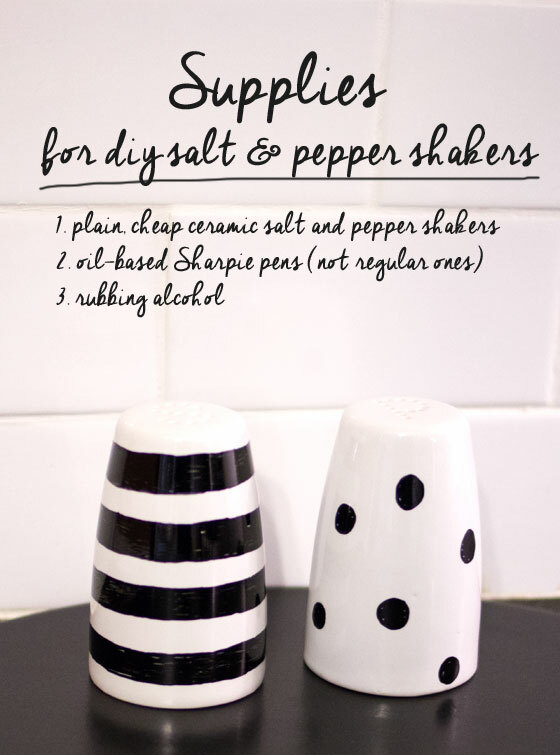 Fill your shakers with salt and pepper and enjoy! 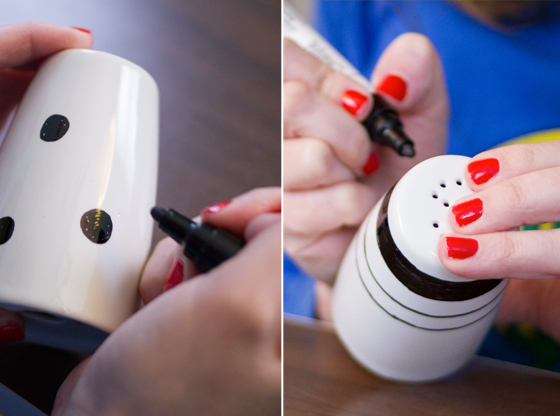 The salt and pepper shakers can be gently hand-washed going forward (no dishwasher), and the colors shouldn’t fade. This project was easy peasy, inexpensive, and I love how they turned out. That’s the perfect trifecta for DIY projects. (The sharpies are kind of pricey, but I’ll use them for a lot of other projects.) 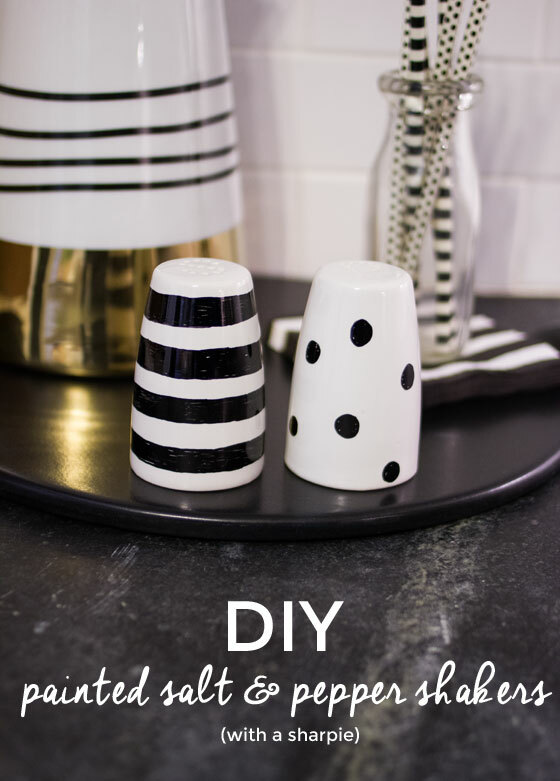 The salt and pepper shakers will look so cute on my table and really go well with the black and white theme we have going on… Who knows, maybe I’ll even be inspired to season my food for a change! P.S. I hope all of you in Cleveland (and probably the rest of the Midwest) are doing ok with this snow!! (And recovered from that stupid game last night. Grr.) Hopefully you’re all cuddled up at home with a bunch of blankets and hot chocolate and have no plans to leave the house today. Poor Andy spent an hour+ shoveling the driveway this morning to get to work, and our neighbor got stuck in the street. Next house: a driveway that can be snow-blown and a street that gets plowed!